Jason Bourne brings Matt Damon back on screen in the flesh, along with other characters from the Bourne Ultimatum like Nicky Parsons (Julia Stiles) and The Asset (Vincent Cassel), and director Paul Greengrass. And while this fifth sequel of the series doesn't actually take the fast-paced and slick narrative forward, what it does is explore the psychogenic amnesiac ex-agent's history. And there's a vendetta drama thrown in for good measure. Nicky Parsons finds the essential clue that links the sequels and gets this installment going - working with a group of hactivists led by Christian Dassault, she discovers crucial information about certain CIA operations after hacking its server, that she feels Bourne might be interested in. Then she discovers the man himself, making a few bucks on the side by participating in illegal fighting rings. She meets him in Greece, but is shot dead by ex-Blackbriar assassin The Asset after a wild goose chase in the midst of anti-government riots at Syntagma Square in Greece. She however leaves Jason a locker key that is to reveal crucial information. Jason alias David Webb discovers that his father, Richard Webb, had some role to play in the top-secret Operation Treadstone, and that he was killed by the CIA. Dewey (Tommy Lee Jones), the current CIA chief, has plans to eliminate Bourne as well, even as CIA cyber head Heather Lee (Alicia Vikander) is keen on re-recruiting Bourne to Special Operations. There's a sub-plot about Aaron Kalloor (Riz Ahmed) and his firm Deep Dream, which is secretly funded by Dewey, who plans to use Deep Dream for real-time mass surveillance alongside "Iron Hand", a targeted assassination program. Dewey tries to kill both Kalloor and Lee at a conference. 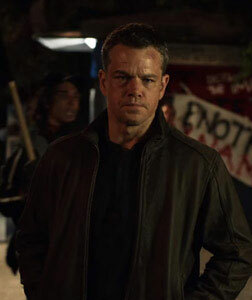 He later tries to kill Bourne as well. There's a lot of fancy technology in Jason Bourne - advanced face-recognition software, uber-cool tracking devices and the best spying devices imaginable. Indeed, the real hero of this spy film is really the tech. It needs to be mentioned here however that it's mostly Lee who manages all the gadgetry and gizmos - Jason, for whatever reason, is tech-deprived in the movie. That's not a bummer, though. There are some action sequences, like the combat scenes on the street and the scene where he battles The Asset to the death, that are quite memorable. There are some well-choreographed car chases (Barry Ackroyd), and if one single car plowing into five others and sending them flying into the air is what floats our boat, then this is a film that might please. There's a kickass bike-chase where Bourne robs a police bike in Greece and sets off with The Asset in hot pursuit. The man-to-man combat scenes involve some tracking and zooming around the two actors, and it isn't bad - but viewers are deprived of a style that might have paid more attention to detail. The camera is always too far from the actual action. Cinematography-wise, the best scenes are during the car and bike chases, and there are some great shots of the riot in Greece and of Bourne's combat scenes. The brisk editing by Christopher Rouse, who also edited Bourne Supremacy and Bourne Ultimatum, never lets your attention waver for a minute, even though the story is not much to write home about. The background score (John Powell and David Buckley) is noteworthy. 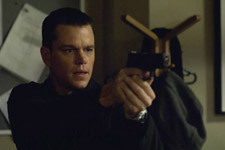 Jason Bourne is totally optional for the normal human being - but if the series is prescribed by your religion, or you're new to action films, or you're a Matt Damon fan, or you like pulp fiction of the Robert Ludlum variety, then we guess you might have a legitimate defence for watching this one. The handheld camera style is somewhat tiresome. The shakiness of the shots became problematic when there is no great confusion in the flat plot, but the camera is too stubborn to admit it and settle down, it looked pretentious. Rather than rehashing, the makers should reinvent Bourne I guess. Even better, they should leave it alone. The trilogy was a masterpiece. fullhyd.com has 700,000+ monthly visits. Tell Hyderabad what you feel about Jason Bourne!